Kavallarioi was the greek word for “knights” and it meant absolutely the same thing as their western counterparts. Bravery in battle and loyalty to the Emperor would be rewarded with a fief and a title which besides honor would also place them in at least two lists of precedence, but very near the bottom. “Kavallarioi” would be given a “pronoia” land, but not as large as that of the “Pronoiarioi”. It was good enough to be able to afford them besides the “esolorikon” ¾ inch thick padded gambeson, an extra “lorikion” chain mail or scale armor hauberk, which whould reach sometimes up to their face, sometimes a “klibanion” lamellar armor cuirass over it and on top of that an “epilorikion” (quilted cloth armor gambeson designed to absorb blunt trauma, like that of a mace). They wear reinforced iron helmets with iron scale aventails and have small iron circular shoulder protectors. A gorget protects the neck made of mail or less likely scale. They carry a reinforced kite shield with the kontarion lance on the other hand. They also carry a “spathion” longsword, 36in long (excluding the hilt), hung at the left hip. Their forearms are protected by “cheiropsella” interlocking lamellar pieces. Lower feet would be protected by “podopsella” interlocking lamellar pieces as well. Kavallarioi “knights” are thus heavily armed, like the klibinarioi of yore, but with a big difference. Their steed is without armor. It really means that they are more maneuverable than their Kataphraktoi brothers-in-arms, but less able to withstand an enemy who has a barded horse. Later on, Kavallarioi with greater pronoia lands (which could supposedly sustain up to 70 infantrymen, other than the “Pronoiarios” heavy knight) would be able to afford an armor for their horse, but Kavallarioi had heavy armor on, if only for the rider. The fall of 1204, in which Konstantinoupolis was sacked bare, marks for many the end of the Roman Empire. For those who survived it, however and had to pick up the pieces, one of the first things they realized, was that between their own heavy but very few in number Kataphraktoi and their lighter armed Stratiotai, a new class of horseman had emerged in the West that was both more powerful and versatile: The Knights. In 1211, 1200 Nicaean cavalrymen defeated the Turks against impossible odds, keeping the Roman holdings in western Anatolia. 800 western knights were among those, and died fighting almost to a man. As such, many former Latin knights were absorbed into what remained of the Empire, and the word “Kavallarioi” from meaning “horseman” became “knight”. Emperor John Katakouzenos (1347-1354) in his memoirs, noted that when Anne of Savoy reached Konstantinoupolis at 1326 with the purpose of marrying Andronikos III Palaiologos (1328-1341) she was accompanied by many Kavallarioi. The “Kavallarioi” are knights, a step up from Stratiotai in morale, horsemanship, chivalry and equipment. 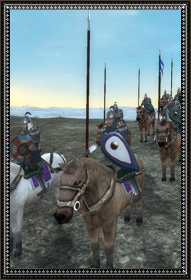 They are the Empires’ best hope at fielding a good enough cavalry, without having to sustain the outlandish costs of horse metal armor as well. Kavallarioi historically fought bravely against very diffucult odds. It was them along with Stratiotai and Trapezitoi who protected the no mans’ land between Nikaian and Seljuk holdings from the gazi Turkmen who attacked anyone who passed through their territory, Seljuk or E. Roman, as their love of loot was legendary. In this no man’s land, the uc/Akra frontiers that separated the two states, Kavallarioi reinged supreme, when properly led. Alexios Philanthropenos was such a leader. Kavallarioi started out as Latin knights, but were fully incorporated into the E. Roman Empire, dressed and talked like Romans and a generation later their children were Romans proper. Before the advent of “Pronoiarioi” (who are basically richer “Kavallarioi” with a half armored horse), they are the best horsemen Romans had.